I was delighted to be asked to speak about this work in Silvia Loeffler’s sixth seminar as part of her ‘Transit-Gateway’ project. Please see link below. A selection of images of ‘Saved’ was be shown at the Coast Guard Cultural Centre in Tramore, County Waterford from the 4th to the 17th of August, 2016. These images will be accompanied by texts from the sitters about their experiences of their ‘shouts’ and the importance of their voluntary work for the RNLI. In September 2013 I started a year-long artist’s residency for the Arts Office in Co. Waterford, Ireland. I looked at the lives and land along the coastal towns of the county in the off season. During my residency year I came to know the crew of the RNLI lifeboat station in Dunmore East. I photographed eight lifeboat men as part of the residency but I quickly realised that this work would become a project in itself. The RNLI lifeboat at Dunmore East has been in existence since 1834. Its mission is to ‘save lives at sea’. There are sixteen crewmembers that can be called upon to man the all weather boat when a ‘shout’ has been issued, the boat needs six lifeboat crew to operate. These people are of all ages and come from all walks of life. They will drop everything when the pager goes off, 24 hours a day, 365 days a year to risk their lives, voluntarily, to save anyone in trouble at sea. There is only one full time Station Engineer at the lifeboat station, the rest of the crew are ordinary people, with regular jobs. The lifeboat and crew are an integral part of the coastline and the communities where they are based. I am interested in making work, which will honour and highlight the amazing courage and dedication shown by the men and woman who serve as volunteers. ‘Saved’ is a photographic project that will consist of images of some of the crewmembers. Dressed in their RNLI survival suits they will be standing in a range of real life locations. These locations are where the RNLI volunteers do their ‘regular’ jobs. Some of the members are Guards, some are factory owners, some work in supermarkets and on building sites. 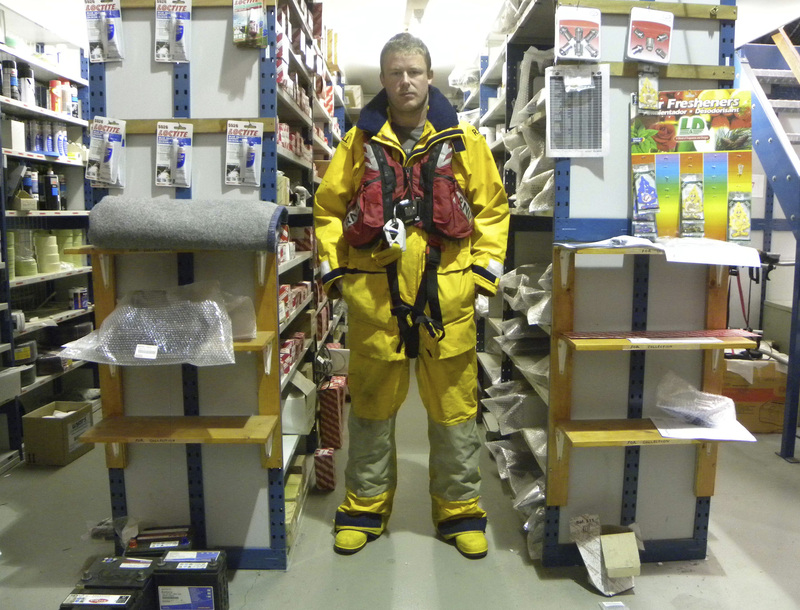 The orange of the RNLI survival suits will contrast strongly with the supermarket shelves, the orderliness of an office or the bareness of a construction site. I have been given the organisations permission and support for this project. The images of the crew are a document to their remarkableness. A job done quietly with a ‘Thank you’ sufficient as reward. Showing the volunteers out of context will highlight the crewmembers as regular people. Printing the image to life size will allow the audience relate directly with the images of the crew they view. I would like the viewer to look the crew in the eye and appreciate the risks and bravery that these people take each time the lifeboat is called out. “I don’t remember what my first shout was back in 2008. I can say however, that people may have an image of the lifeboat crew pulling the person out of the water. However, from my experience, it can be towing a fishing boat with engine problems to the harbour-where landing a fresh catch means the crew being able to earn their livelihood”. Jon Walsh – Crewman – Gardai. 8 years service. 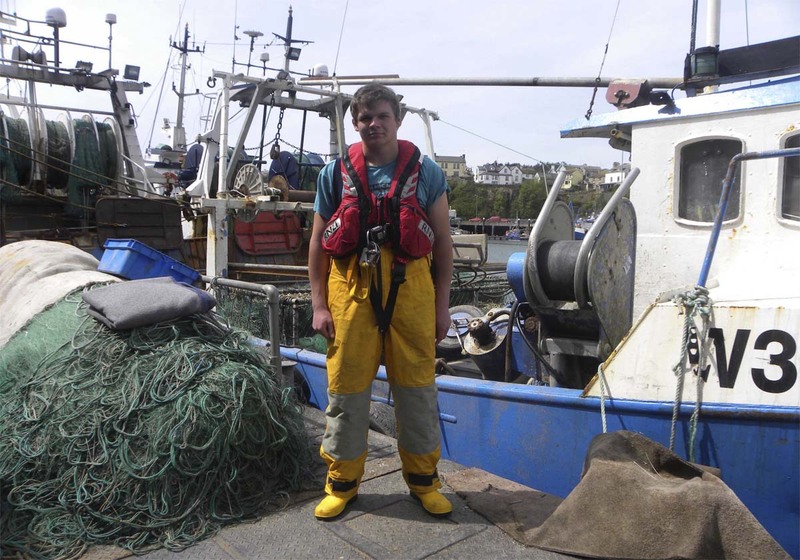 Cian Daniels – Crewman – Fisherman. “There are generations ahead of me on the lifeboat, there was never really any question of me not joining. It was the big orange boat in the dock and I always wanted to go out on it. It was never a question in my mind, I was going to join it when I was of age. There are very few new members who have a fishing background. They might have done days here and there, but not active fishermen. The father and myself would be the active fishermen on the lifeboat. When I joined it there was an older crowd, many of them fishermen with years of experience. They were very good to me, not just with the lifeboat but also in my fishing career. They taught me little things and little knacks, which I still use to this day. Josie Murphy, was one of those fishermen, he was great and taught me loads”. David Murphy – Crewman – Car Sales/Parts Dept. “When I joined the RNLI when I lived in the village, now I work in town but I am still part of the crew. It does not take all of your time as we have a good amount of people to call on. Sometimes it does not suit you but you don’t get punished for it. There are no deadlines; you can only do what you can do. It’s worthwhile doing it. Recently we had a shout at about 2.30 in the morning. I remember going down the corridor thinking ‘it’s just too early in the morning for this kind of thing’ but you wouldn’t question going out, it is an important thing to do. Being on the lifeboat runs in my family, much like with the other lifeboat crews. If you are local it’s something that you do. I remember a shout when Jon Cody and I were up on the bow, it was late at night, around 11.30 pm. We could hear and see the light at the top of the life raft, which gave us a location. When we got there it was half inflated and there was a man hanging on to it. We went down to the deck to pull a man with oilskins and wellies on board, it was just a really heavy weight. We got him in, but the others weren’t sound at all. I remember that to this day. When the shout went out for the Pere Charles, I knew that there were people on that boat that I knew from the community. It was going on for a couple of days and we were exhausted but everyone on the crew was committed to staying on. On a personal level it is so different as you know these people compared to people who you don’t have a connection with. It doesn’t make the job any different but it does affect you differently. You are there for hours doing search patterns and you are alert and wide-eyed, searching and hoping. There is a close-knit connection between us. We have an annual Blessing of the Boat and a BBQ and try and raise money. Recently we have started to go on team building trips, off the boat. It is always a good thing to get everyone to chat together. Even when you are on a shout you can easily get hit by something or swept off the boat if you are not paying attention, it is dangerous, there is no doubt about it. You look to those who have had a few more years experience to teach you or keep you safe as a crew. The minute we get on the boat there is a head count and there are briefings before and after we get off the boat. You are 80% trained for what you do and then there are things you can’t train for. You have that togetherness, that something shared that gets you through that other 20%, and you have instinct. You trust the Coxswain decision in whatever situation you find yourself in. You don’t really think about what you are doing on a personal level as much as you trust in your team to get you home”.